Looking to buy a new washing machine? Investing in a good quality washer makes doing the laundry easier and more efficient, so it's worth spending at least a little time thinking about which model of washing machine will best suit your needs. To speed up the decision-making process – particularly since washing machines are often bought in distress to replace a broken model – we've reviewed some of the best models available on the market, significantly narrowing down the overwhelming number of options available to you. We've covered everything from eco efficiency to the variety of spin cycles, so it's well worth a read before investing in a washing machine. Read our guide to how to buy a washing machine and tumble dryer for buying advice. If you're looking to make a saving, you might want to take a look at our pick of the best washing machine deals, too. For more washing machine buying guides, as well as advice and inspiration for other household essentials, take a look at our appliances hub page. We rate the Samsung WW90J6410CX Freestanding Machine as the best washing machine currently available. For an affordable model, it's packed full of special features designed to ease the process of doing laundry, including 'Bubble Soak Technology,' which removes stubborn stains with no extra effort from you. A high energy rating and twin water supply also reduces energy costs, meaning you'll save money running this washing machine compared with other models. On top of this, ecobubble™ technology activates detergent at temperatures as low as 15˚C. The most important thing to consider when buying a washing machine is the type of laundry you wash on a regular basis. Some washing machines come with special programmes to tackle pet hair, tough stains on sportswear, work gear and school uniforms, while washing machines with short wash cycles are a great bonus for when you’re in a hurry. It's worth taking time to consider which of these settings will make laundry easier. As well as the variety of programmes on offer, look at features like spin speeds, capacity in kilograms and standout features such as eco cycles and special cycles for woollens, delicates, duvets and anti-allergy options. Eco-wise, check the energy rating and water consumption as well as half loads, timer delay, sensor washing and auto detergent dispensing, which detects how dirty the clothes are and adjusts the programme and detergent accordingly for the most efficient wash. Considering it's so affordable, this model is packed with special features designed to make laundry easier and more efficient. A high energy rating means running costs are low, while a twin water supply means you’ll get a super speedy wash in just 60 minutes, which is perfect for busy families. It even has what Samsung calls ‘Bubble Soak technology’ to remove stubborn stains, making this a great choice for families. Users also loved the fact that you can wash large loads at low temperatures thanks to the ecobubble™ tech, which activates the detergent to quickly penetrate fabrics, even at 15˚C. If you're open to spending a little more money on a washing machine, you'll benefit from the latest in app control operation, and while this unassuming white washer looks relatively simple, it is actually awash (it's okay, you can smirk) with features. Smart connectivity allows you to turn the machine on from wherever you are, meaning you can programme washing to be freshly finished by the time you get home, while the option to make the most of tutorials and tips seeks to make the process of doing laundry that bit easier. Users have also been impressed by the AutoStain recognition technology, which targets 16 of the most common stains such as red wine and oil, so you don’t need to worry about a pre-wash or applying special detergents to tackle tough stains. Find more tips on removing red wine stains in our cleaning guide. Awarded the Quiet Mark, this low decibel rated washing machine could be the option you're looking for if you live in a small apartment and want to minimise disturbance to your neighbours, or are tired of your washing machine overpowering conversation in an open plan scheme. Another reason for the popularity of this washing machine model is its use of ÖKOMix technology, which ensures that fabric is cleaned and cared for in shorter cycles but ensuring that detergent, fabric softener and water are dissolved and activated before entering the drum. On top of all this, the AEG L8FEC946R freestanding Washing Machine boasts a high energy rating, large capacity for bigger loads and anti-crease ProSteam® technology, which can add steam at the end of a wash cycle if you want it, reducing the need for ironing. Looking for more quiet washing machines perfect for an open-plan kitchen-diner, you'll find our pick of the best in our specialist guide. As well as an outstanding A+++ energy efficiency rating, generous capacity and impressive spin speed, the WCE320 QuickPowerWash freestanding washing machine benefits from the superb German design, quality and workmanship you would expect from a Miele appliance. It features a SoftSteam honeycomb drum that causes garments to glide on a thin film of water, preventing piling or laddering. Plus, Miele's PowerWash function allows this machine to operate up to 40 per cent more efficiently than the standard required to achieve an A+++ energy rating, even when washing smaller loads. Reviewers loved the AutoClean detergent drawer, as it’s self-cleaning with a special surface coating. This really is a washing machine that takes care of everything. Added features include Dark Wash, Delicate Wash, Hand Wash and a Wool option as well as sports programme, quick wash, half load and a snazzy digital display. 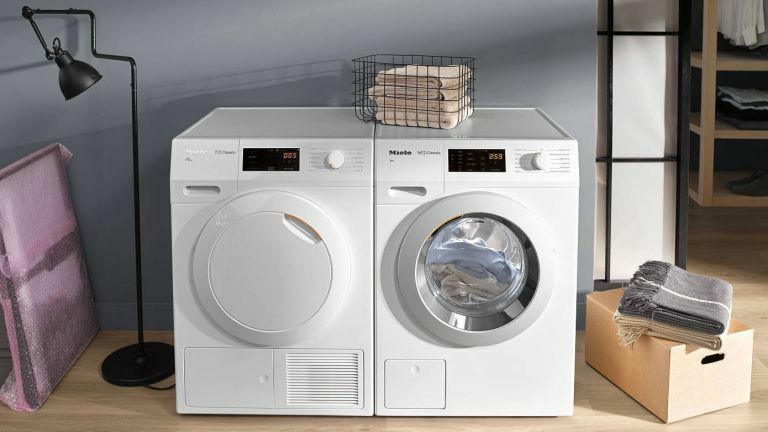 When you want something that’s easy to use, this model features a clever Push & Wash function, which starts the wash cycle with just one push of the button without having to faff around with adjusting the settings. Those with limited time on their hands and who are always in a hurry love the ‘one touch’ operation as well as the Water Balance Plus technology, which adapts the amount of water used according to what’s required. There are 14 programmes including special options for Sport, Wool and Delicates as well as variable spin speed for less creasing. Tech lovers can’t get enough of this machine’s Wi-Fi connectivity, which means you can control your laundry from wherever you are using the Home Connect app on your smartphone or tablet. Add to that the large capacity for big loads and excellent stain removal and this is a big hit with families. There are special programmes for Curtains, Shirts/Blouses and Mixed Fabrics as well as cycles for Hygiene, Handwash/Wool and a Textile guard re-proofing programme. For those who sometimes struggle with fancy control panels, the large display on this model is much easier to navigate. Looking for more laundry and utility advice?